Traveling up! Let’s go Sagada! Entako’et id Sagada! This is not your ordinary sight-seeing trip. It was a test of courage, stamina, mind work, wit and charm for two girls who embarked into the fortress of the Cordillera. From eight possible travelers down to two, what lies ahead for these two backpacking girls traveling North for the very first time? Organizing the trip was not easy. Violet had read more than 30 blogs to consolidate details for the up coming trip. A month preparation it is! From the main attractions, mode of transportation, rates and prices, fixing schedules, people that could possibly help in making the trip smoothly sailing and to a point of what to bring and what to expect in Sagada is noted. 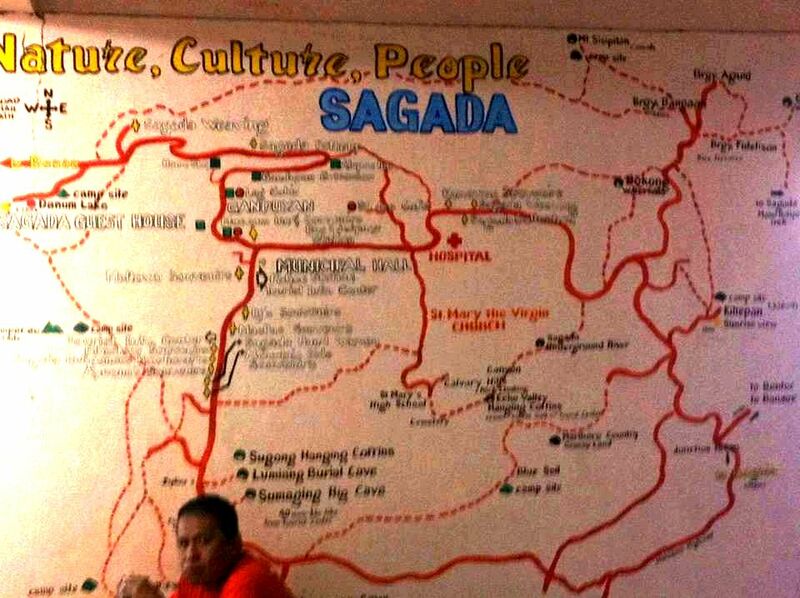 Here is a SAMPLE ITINERARY created before going to Sagada. Manila to Banaue: Take Ohayami bus located at Cor. J. Fajardo St., Lacson Ave. Fare: 450 pesos and leaves at 9:00 PM and 10:00 PM daily (reserve if possible). Banaue is such an enchanting place. It will definitely take your breath a way or make a heart beating fast. Its people are amazing and it was overwhelming for a first timer. What exactly do two girls do in Banaue? Here’s to a QUICKIE BANAUE. 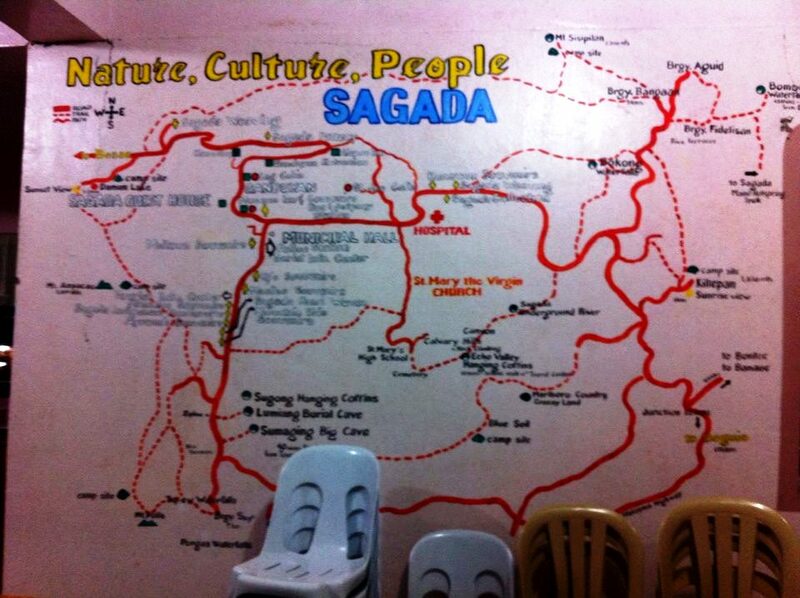 Banaue to Sagada: Arriving in Banaue, expect to be welcomed by people working in the transportation. They will offer you ways to get to Sagada via van (300 pesos) or via jeepneys going to Bontoc or straight to Sagada (try the topload). Do not forget to take a view from Banaue Viewpoint and if you like museum, you better see Bontoc Museum in Bontoc (1-2 hours away from Banaue). Arriving on a Monday, lesser adventurer arriving, left Violet and Len to take the van. It took them to the Banaue Viewpoint (which is delightful) but didn’t let them to take a sneak peek on the Bontoc Museum which is really get into Violet’s nerves (she’s really hoping to see it). After 3 hours of traveling and witnessing the beautiful terrain of Banaue and Mountain Province, it’s showtime! Violet and Len stayed in Sagada Guesthouse for two nights. There are plenty of rooms but be sure to reserve before coming here (especially if arriving on weekends), well it’s Monday for them, so it wasn’t a hassle to arrive with no reservations and all rooms are almost available. The RATES are reasonable and negotiable. The guesthouse is located near the main road making it a good place to stay at and accessible to the information center, transport terminal and restaurants. 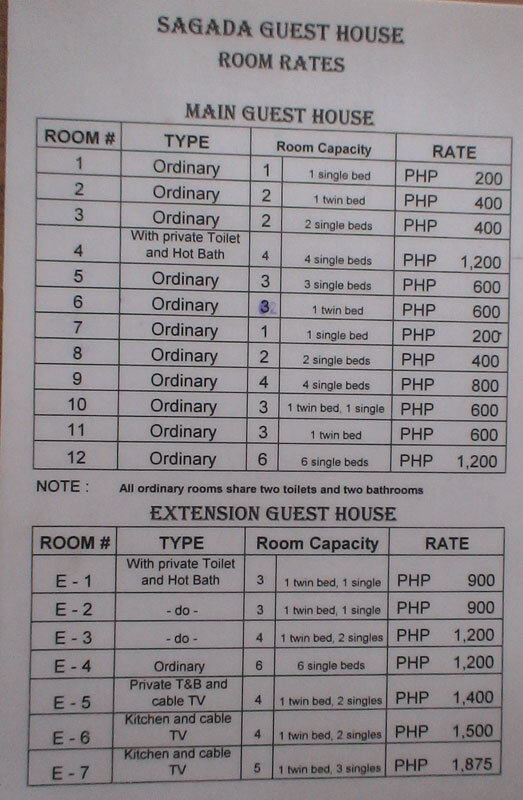 Here is the review for SAGADA GUESTHOUSE and some interesting facts about it. Tip: You need to gather all your strength if you want to walk it all (but you need a guide) and if you don’t want to walk, you’ll need to stretch your wallet. Do you really need a guide? Do you really need to rent a vehicle? Why? Here is an honest answer and an essential read. 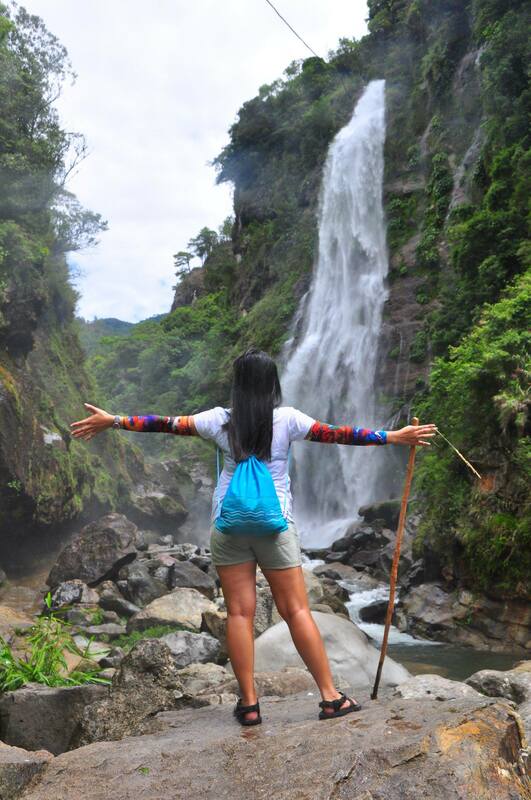 Note: There are two group of guides in Sagada: Sagada Genuine Guides Association (SAGGAS) and Sagada Environmental Guides Association (SEGA). We choose the later since they’re stationed in the information center while the other is a bit farther (and SAGGAS Guide didn’t replied about inquiries). This excerpt from the lyrics Leaving on a Jet plane do make sense for a traveler. Since Sagada is a place for adventures – exploring from above and below the ground, means you need to know the essentials stuff to bring. Try the different taste of Sagada and find the pleasure of its uniqueness. Here are some of the food places and it’s review. 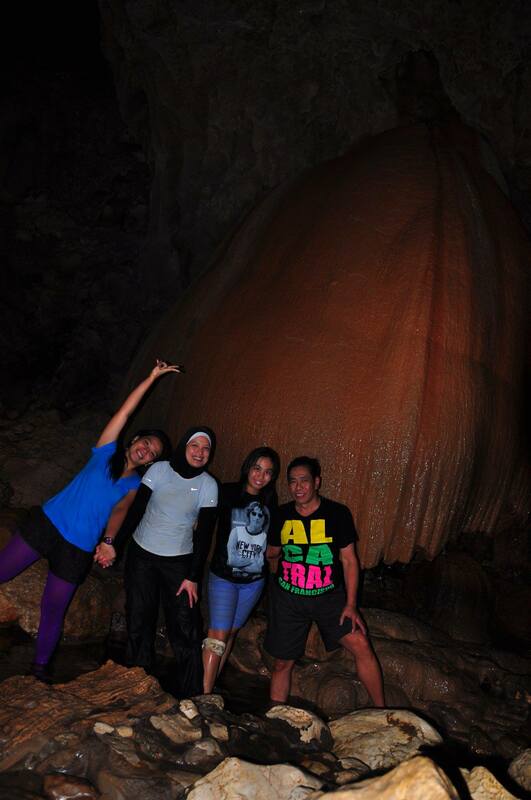 3D/2N Entako’ed id Sagada Adventure! Check-in and a little rest. It’s already lunch time, we got of the guesthouse and look for good food. After 2-3 minutes of walking. We arrived in Salt & Pepper and took our order. Then, searched for the famous lemon pie house and bought 2 slices of pie (egg and lemon) for 60 pesos. Delightful Sagada Food! Behind the Cave Connection: It was a great idea to try cave connections instead of normal caving. So many stories to tell. After the fun yet super tiring activity, we had so many stories to share and to recall inside the van. Thank God we hired that van cause I know I couln’t walk anymore. hehehe,,, I just want to eat and get some sleep. 6:00 AM: Walk looking for breakfast. Sagada is still asleep. 3:30 PM: Seeing hanging coffins, weaving and pottery making, lake danum sunset but it rained (cancelled) instead buy pasalubong.